A major influence in the Cleveland area for over three decades, Parker creates largely through intuition and emotion. 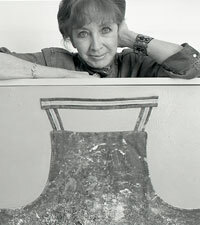 She developed her mature style in the mid-1970s, at a time when the local art scene was dominated by hard-edge, geometric painters. Although painters in other parts of the country, including Neo-Expressionists and New Image artists, were working along a parallel path, Parker developed her idiosyncratic, visual vocabulary independently. She creates highly evocative and poetic images by combining simple, quirky forms with gestural brushwork. She typically builds up rich, sensual surfaces with multiple layers of latex-enamel paint, often applied over or around collage items, such as pieces of cut canvas or cardboard attached to the surface. The manipulation of these materials suggests the content and direction of the work. This is derived from the painting methodology of Jackson Pollock. By forging an alternative to rigidly formalist art, she has been a powerful role model for artists throughout the region.